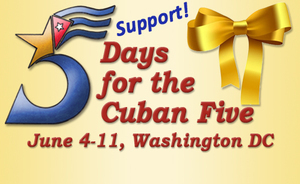 “5 Days for the Cuban 5” in Washington, D.C. The ANSWER Coalition has endorsed the "5 Days for the Cuban 5" organized by the International committee to Free the Cuban Five. We encourage our members and supporters to participate in as many events as possible. We are circulating below the official announcement for the event. From June 4-11, activists from across the country will converge on Washington, D.C., for the third “5 Days for the Cuban 5.” The Cuban 5 came to the United States during the 1990s to monitor the activities of terrorist groups of Cuban exiles in Miami and were arrested in 1998 for doing just that. Expectations that there would be some leniency in the U.S. justice system, given that the 5 never threatened U.S. security and had collected no classified information, have not materialized. The only reason that two of them, Rene Gonzalez and Fernando Gonzalez, are back in their homeland is that they completed every day of their unjust sentences. If the three others must serve their entire sentences, Antonio Guerrero will be free in 2017, but then will have to serve an additional five years under supervised probation because he was born in the United States. Ramón Labañino will complete his sentence in 2024 and Gerardo Hernandez, the most punished of the Five, has no date of return because he is serving two life sentences. People from all over the United States, Latin America, Canada and Europe are joining together to ask President Obama to change a policy of hostility towards Cuba that has gone on for over fifty years. One of the pivotal points in this widening discussion is to find a solution to the case of the Cuban 5, which for over 15 years has raised serious questions about the absence of U.S. justice. The activities in June will include a two-day conference entitled “New Era in U.S.-Cuba Relations.” Speakers will include Rev. Joan Brown Campbell, Actor Danny Glover, William Leo Grande, Lawrence Wilkerson, Tom Hayden, Wayne Smith and Gayle McLaughlin, among many others. Also a number of parliamentarians from other countries will accompany people from the U.S. to make visits to Congress. Highlights of the 5 Days will be a concert by the progressive hip-hop duo “Dead Prez” and a rally in front of the White House, calling on President Obama to free these men who, in fact, are anti-terrorists. Many known individuals from the United States and abroad have already endorsed, including Angela Davis, Noam Chomsky, Alice Walker, Ignacio Ramonet, Father Miguel D'Escoto, Frei Betto, Piero Gleijeses, Cindy Sheehan, Martin Garbus and hundreds of others from all over the world who have added their voices of support.